Even if you haven’t seen the cult classic surf film, Endless Summer II, it probably comes as no surprise that Costa Rica is famous for its surf spots. And it’s not necessarily because the country is home to the gnarliest breaks or biggest professional events. It’s because Costa Rica is one of the most beautiful and challenging-yet-forgiving places to surf. The Pacific Coast of Costa Rica is home to hundreds of surf breaks that are largely uncrowded and perfect for both beginners and professionals, alike. Witch’s Rock and Ollie’s Point are some of the most famous spots in the world, accessible by boat only. But what if you’ve never surfed before and want to learn? You might want to start in Costa Rica! The country is home to dozens of surf schools and all-inclusive surf resorts. Perhaps the most intimidating part about learning to surf is fighting off the (sometimes aggro) crowds and finding a space to practice in peace. As breaks around the globe continue to attract surfers (beginners and professionals, alike), it’s becoming much more difficult to find a spot where you can test out the waters. Costa Rica’s camps and resorts completely change the game. Most resorts feature virtually crowd-free beaches and waters since their guides take you to virtually uncrowded beaches. And, more importantly, they’re home to some of the friendliest instructors in the world. You won’t feel like you’re making a fool of yourself or be bullied in the water. The best part is, once you get the hang of it, you’ll have uncrowded lineups all to yourself. And, maybe, a few friends! If there is a bad surf break in Costa Rica, we haven’t found it. In fact, it probably breaks more consistently that many in California. Just drive a few miles and find uncrowded lineups and empty waves. 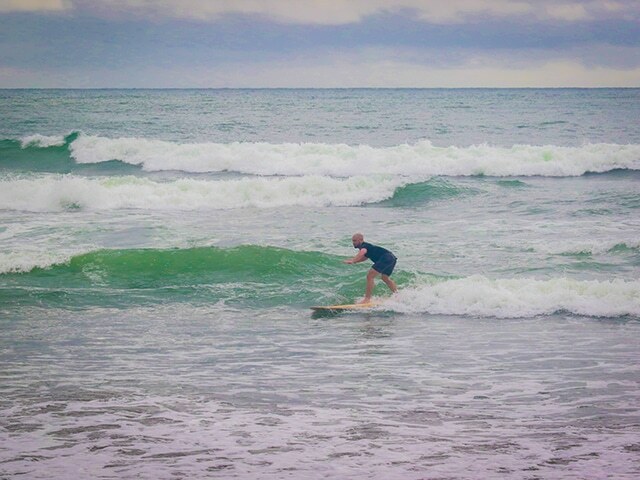 But what really makes Costa Rica special is its commitment to helping beginners learn the art of the wave. It’s unlikely you’ll find the aggressive crowds that notoriously plague the Hawaiian Islands. Even the Costa Rica natives are welcoming and offer insight into where to find the best surf, tips for catching more waves, and at which tides to surf. The country’s motto, Pura Vida, is a philosophy and lifestyle that you can definitely feel when you’re out on the water—it’s no wonder everyone is so stoked. There might be nothing more soothing than stretching your toes over soft, ocean sand. That’s what is best about beach breaks: they’re made up of sand. You won’t have the misfortune of stepping on a sea urchin or catching an overhead-sized wave, only to drop in too late and come crashing down on sharp, jagged reef, consider yourself lucky. Surf injuries (especially in tropical destinations) are very dangerous—and we’re not even talking about sharks, yet. Luckily, most Costa Rican breaks are sandy shorebreaks, meaning that if you fall off your board (which, as a beginner happens), you won’t hit the razor-sharp reef. In fact, most of the breaks are in water deep enough that you don’t have to worry about hitting the bottom! Sharks are one of the most common fears of surfers, beginners and advanced alike. However, in Costa Rica, shark attacks are extremely uncommon. The Central American country is one of the safer territories of the world, as far as shark attacks are concerned. You’re more likely to see beach monkeys than you are tiger or bull sharks. And great whites hardly even venture down there. Most beginners shudder at the concept of wearing a wetsuit to surf. Especially in the frigid waters of California or Oregon. If you live in the Midwest, you can definitely surf the Great Lakes in the winters, as long as you’re cool with 32 degree (Fahrenheit) water temps and bone-chilling 8 degree (Fahrenheit) air temps. Costa Rica, on the other hand? The Pacific side maintains an average annual temperature of about 83.5 degrees (Fahrenheit). You know, like bath water. A tad warmer than your indoor lap pool. Not quite as spicy as a hot tub, but close. No need to pack a wetsuit, ever. With perfect breaks, beaches, and surf schools, you should immediately book a trip to Costa Rica if you’re curious about learning to surf. The best part? Every school and instructor guarantees you’ll get up—even on the first day.